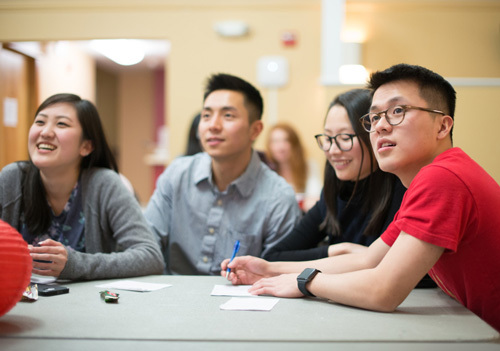 Several times a week, the Asian Studies program sponsors language tables where students get the chance to practice their linguistic skills in an informal setting. Below you can find a list to the language tables offered by the Asian Studies Program. Another special feature of the program is the Chinese Table, or 中文桌子, which is offered once a week for students to chat freely with their teachers and other Chinese native speakers. It is held in the Thorne Dining Hall, Hutchinson Room, every Tuesday from 5:30 to 7:00 pm. Come speak Hindi-Urdu with interested students and faculty! Keep up your language skills, develop your language skills, or simply enjoy an opportunity to speak the language. All levels welcome! Thursdays, 5:30 to 7:00 pm, Thorne Hall, Mitchell North. 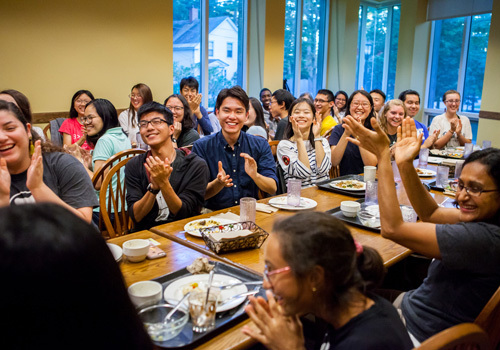 Every week the Japanese language teachers meet with students to practice Japanese and share stories over dinner in one of Bowdoin’s dining halls. It's a great way to get to know other Japanese language students and faculty. Even those students who are just starting out can learn something by listening to what is going on around them and trying out what they have learned in class. Students interested in Asia have the opportunity to join a number of Asia-related student-run clubs: Asian Students Alliance (ASA), Chinese Language and Culture Club (CLCC), Japanese Students Association (JSA), Korean American Students Association (KASA), and South Asian Student Association (SASA). These organizations aim to create spaces on campus for students to learn about different Asian cultures and identities. They often organize and sponsor cultural as well as academic events throughout the year. Membership is open to all students.